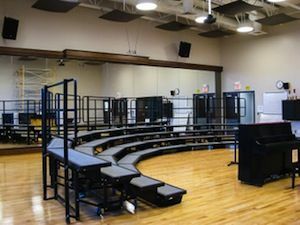 City High School in Iowa City, IA, recently opened a new performing arts wing that features Q-Sys Core 250i integrated cores in music rehearsal rooms with QSC GX5 power amplifiers powering the installed loudspeakers. The new wing built at a cost of over $6 million is designed to accommodate rehearsal rooms for the band, orchestra, and choir and the more than 500 students in the school’s music and performing arts programs. In addition to the rehearsal rooms, the facility hosts a suite of smaller practice spaces, classrooms, and other support amenities. Douglass Communications of Ottumwa, IA, provided design and integration services for the installed sound systems. In addition to the rehearsal rooms, the facility hosts a suite of smaller practice spaces, classrooms, and other support amenities. “We wanted a solution that would enable us to control everything off of an iPad,” said Matthew Bresch, senior technician and systems designer at Douglass Communications. “So the RS-232 control, to be able to control all of the equipment with the QSC Core, was a huge thing. Once we started looking at Q-Sys, we saw how much simpler it was to program than most of the other DSP programs that are out there. The Q-Sys Cores in the two band spaces, which are located downstairs and measure approximately 2,000 square feet each room, also enable room combining when the central divider is removed. “Iowa City High has a big marching band program, so sometimes they need a bigger room,” he added. The custom control interface was created with a uniform look for all four rooms, using Q-Sys Designer software. Tara Bresch, operations manager for Douglass Communications, designed the custom iPad user control interface using the tools in Q-Sys Designer software. “We gave it a uniform look for all four rooms. There are just two pages, record and playback,” she said.